Hayabusa Fishing’s Spin Muscle Guard is the ultimate finesse fishing hook. Its sharp V-bend technology accomplishes two major tasks: soft plastic worms and other bass fishing soft baits are held in place and rod action movements travel via the fishing rod to the soft bait. This replicates precise, life-like forage movement that produces reaction strikes and/or hunger strikes. The black matte Spin Muscle Guard utilizes a flexible fishing hook guard that prevents snags while never interfering with superior hooking performance. This hooking performance is a direct result of the Hayabusa Original Point‘s press formed sharp and durable hook point and semi-twisted hook point. Its low weight balance (achieved due the hook’s size and designed angles) maximizes attractive rolling action that drives largemouth bass, smallmouth bass, and spotted bass into a feeding frenzy. 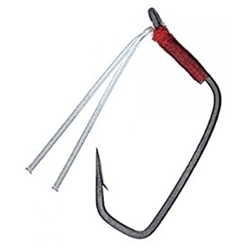 This hook’s superior wacky worm and/or finesse fishing performance follows a simple process: hooking power travels directly to hook point with slight flexibility that allows the hook to penetrate deeper as the bass fights harder (reaches the hook’s first bend angle), followed by the final bend penetrating deeper and preventing bass from coming off. The Spin Muscle Guard achieves what other wacky worm and/or finesse fishing hooks cannot – namely providing bass anglers with stable penetrating hooksets that actually dig deeper as bass thrash, fight, and attempt to throw the fishing hook.